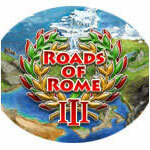 Roads of Rome III Game - Download and Play Free Version! Barbarians have ransacked farms and other productive buildings across the Roman empire! Fallen trees, fires, floods, potholes and rock slides have damaged the roads! 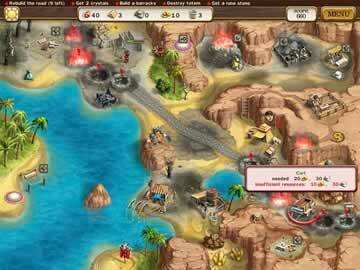 In Roads of Rome III, your goal is restore productivity in the empire and use that productivity to rebuild the roads. It may be necessary to utilize several different resource types, including stone, lumber, gold and water. You are given a certain amount of time to complete this goal before the barbarians return and ransack the area, forcing you to start again. Roman soldiers come in to defend the area once the road is rebuilt, so you can move on to the next stage. The gameplay is a basic time management scheme, meaning that you have to decide how to best utilize your productive time. You begin with a single villager and a wasteland of possibilities. You have to decide if you want to gather enough wood to rebuild the farm, gather food to train another villager, or gather gold to start work on the road. As you clear more of the road, you want to make sure your resource flow remains strong enough to meet the level's demands within the time limit. As you hire more villagers, the decisions become more complex as you keep track of up to three separate workers completing tasks. As you clear more of the road, other parts of the stage open up, giving you access to more resources or adding tasks to your regimen in addition to clearing the road. Your productive buildings require regular visits from your villagers to keep producing resources, and natural disasters like earthquakes may force you to rebuild them. This game appeals to gamers who like fast-paced problem solving. Most of the levels, especially near the end and at high difficulties, require you to develop a game plan before you begin. Each level usually takes about fifteen minutes to complete, and it may eventually feel like you have to flawlessly execute the routine to get the "expert" rating. The level of challenge is probably the most fun thing about Roads of Rome III. It starts out easy, but about halfway through it becomes quite challenging. Each finished stage feels like a major accomplishment, especially if you're playing on advanced difficulty levels. The only downside is that a single misclick has the potential to derail an entire level. Nevertheless, a logical plan followed through to completion usually leads to success, making Roads of Rome III an incredibly satisfying gaming experience.